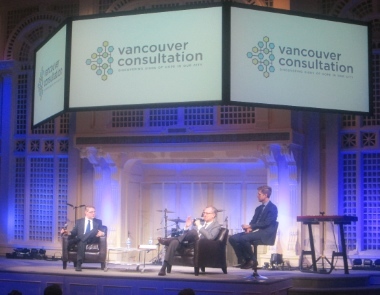 A Catholic-Evangelical Conversation sponsored by the Vancouver Consultation took place at Coastal Church. 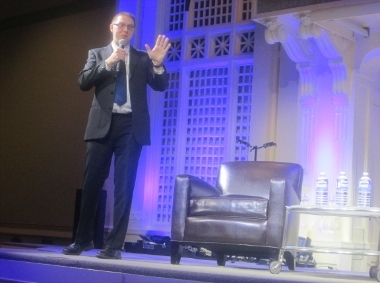 Coastal Church recently hosted a Catholic-Evangelical Conversation, as part of the Vancouver Consultation process. The core of the two-hour event was a gracious exchange between Brett Salkeld, archdiocesan theologian for the Roman Catholic Archdiocese of Regina (here with blessing of Archdiocese of Vancouver), and Jeff Greenman, president and professor of theology and ethics at Regent College. Here is a portion of the introductory comments by Salkeld and Greenman, followed by their thoughts on what each community can learn from the other. For the full story, you can watch the video here. Brett Salkeld, a theologian for the Archdiocese of Regina, was here with the blessing of the Archdiocese of Vancouver. 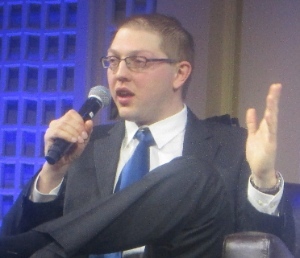 Brett Salkeld: Sometimes we get the impression that dialogue is the opposite of evangelization. We can either evangelize people or we can dialogue with them. And we have to admit that people sometimes use dialogue as a way out of evangelizing. I want to assure at the front end that I have no intention of doing that. Evangelicals who might be nervous about dialoguing with Catholics because they think Catholics need to be evangelized rather than dialogued with . . . please, please, please keep evangelizing us. Someone’s got to do it, right? Everyone’s got to be evangelized; Christians need to continue evangelizing one another. Dialogue is not the opposite of evangelization. In fact, in a lot of ways, it fits right alongside the national Roman Catholic-evangelical dialogue. We’re always in dialogue with one another, and we’re always trying to evangelize one another. One of the jokes is, you don’t go into dialogue to convert the other person, but we say, actually, yes, we want to convert each other more to Christ. That’s part of the process of dialogue. So, I want to keep that as kind of a framework. But within that framework, I think there’s a challenge that a Catholic can offer to evangelicals about how do you go about evangelizing Catholics. What I’m about to describe may be something you’ve seen people do; it may be something you yourself have done. . .
Go to a major Catholic event – World Youth Day or something; I was just at the World Meeting of Families in Philadelphia – and often there will be evangelical Christians outside of those events, handing out pamphlets, engaging in . . . maybe dialogue, maybe argument, maybe something outside. I think there’s a key mistake that evangelicals can make when evangelizing Catholics, which is to tell Catholics what they believe. There’s a lot of stories about what Catholics believe in evangelical communities. We re-sacrifice Christ at every mass or we worship Mary or something like that; we think we’re saved by works. It’s very common, as a Catholic, to encounter an evangelical who will tell me I believe in these things and that I need not to believe in them. And then I say, but actually I don’t believe those things, and it’s sometimes hard to get a person to take you seriously. . . . There are ways of evangelizing that build up the body of Christ and there are ways that, even if they give some indications of success – maybe a person says the sinner’s prayer or leaves the Catholic church and joins an evangelical church, and that looks like a victory for evangelization – what I think we see long-term is that actually is a way of breaking down the body of Christ because if it happens in a way where Catholic teaching was misrepresented, where people weren’t allowed to honestly engage with what their actual belief were or whatever, we see this terrible situation where some of the strongest anti-Catholics out there are former Catholics who have been given the wrong information about their own community. . . . So I want to say, evangelize Catholics, but how do you do it? You don’t have to say the differences in doctrine or anything are irrelevant, but say, “Tell me about that. I’ve heard this thing that you guys believe about Mary. Am I accurately saying that? Does that sound like how you would say it? Oh, it’s not? How would you say it? Explain that to me. That’s interesting, but I don’t see how it fits with that other thing you’re talking about. To me those things look like opposites. Can you tell me how, to you, they don’t look like opposites?” . . .
Jeff Greenman (left), president of Regent College, with moderator James Borkowski. Jeff Greenman: The first thing to say is I just think it’s very important that events like this happen and it’s great that you’re here. It’s very important . . . that evangelicals and Catholics find in one another brothers and sisters, and find companions in a journey of faith and find people to work together with in the mission that Christ gives to the church in the City of Vancouver and elsewhere. We should really be the best of friends, and yet I find a lot of evangelicals don’t know very much about Catholics, honestly, and probably don’t know any Catholic Christians very deeply. I do know quite a few evangelicals who have very strong ideas about the errors of the Catholic church, but they’re not typically the same people who have very deep relationships with Catholics. So my point is that it’s easy to have stereotypes of another group that you’re not very familiar with. This goes in both directions in the dialogue that we’re about tonight and in these relationships. I just would call upon people to first and foremost get to know one another because we have a lot to learn from one another.. . . as brothers and sisters with a common faith we should be really good friends, and we should be shoulder to shoulder in trying to present Christ and live for Christ in our city. . . . The way that I see evangelicalism as a movement – and I see it as a movement rather than as a distinct kind of a stream per se – is over and against nominal faith. . . . And still to this day, a very strong cord of evangelical conviction is that Christian faith is more than a nominal faith. 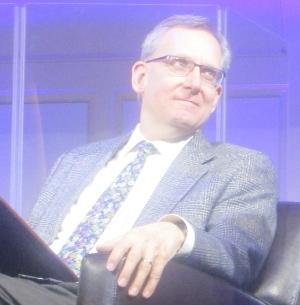 It’s more than just going to church on Sunday, it’s more than a cultural practice that you have continued because your parents did or your grandparents did. . . .
Brett Salkeld: Something Catholics can learn from evangelicals . . . I’ll start with a small story that leads into this very well. I read a book by a former evangelical who’s a Catholic now, and she talks about what leads so many Catholics out of the Catholic church and into the evangelical churches. She said, very often the pattern is this – a Catholic starts getting excited about their own faith, they want to read the Bible, they want to talk about their faith, they want to encounter Jesus personally, and they start doing it in their own parish. And people look at them like they’re weird. That’s not what we do here; we show up and we don’t really talk about anything. We go through the ceremony, and afterwards, if we stay for doughnuts or something, we’ll talk about the Roughriders or the weather, but we’re not actually going to talk about Jesus and our life of faith with each other right. So the person who’s on the cusp of a spiritual breakthrough feels stifled in their own community – and very often these would be the people who would make the best Catholics, who would be the leaven in our own communities, who would be able to be leaders and to spread that joy of the gospel within our parishes. But they get discouraged at an early stage and they almost feel forced out. So, I think real key things that Catholics can learn from evangelicals are being comfortable – not just comfortable, being happy, being excited – talking about Jesus like we’ve met him. There are small subsets of Catholicism that do that, but as whole Catholics need to learn that. Even the small subsets of Catholicism that do that well – I want to go out on a limb here and say – most of those learned from evangelicals. We didn’t start that on our own, we’ve been picking it up. This happens in campus ministries, where you have Catholic campus ministries that are consciously modeled on evangelical campus ministries. There’s other contexts like that. So we learn from evangelicals and we need to learn it more. Going along with learning how to talk about Jesus is also being really explicit that part of our mission is discipleship. This isn’t just about showing up for your sacramental grace fuel fill for the week, but you actually need to be called into discipleship. A lot of practices in evangelical communities that involve mentoring or small groups or accountability partners – those kinds of thing – that goes a lot to forming people who are intentional about what they’re doing as Christians. And the last thing I think is also related to this is making every Catholic realize that they’re responsible for their own parish community. When I go to an evangelical church, most of the people – at least most of the regulars – are actively involved in some form of ministry within their own community. In Catholic circles that percentage is way lower. We lean heavy on the core, but they’re a tiny percentage, and a lot of people just show up and leave, and never participate in the life of the parish beyond Sunday mass, never participate in outreach. . . .
Jeff Greenman: What could evangelicals learn from Catholics? One is this richer, deeper sense of the church. 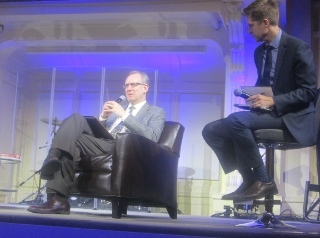 We’re going to have different ideas about church, but to get beyond this individualism of the evangelical tradition into a sense that this is an embodied people who have been an embodied discipling community for a very, very long time and has very deep roots, I think is very important for evangelicals to come to appreciate. A lot of evangelical churches, a lot of evangelical leaders, have been in a sense moving in the direction of being more appreciative of liturgical worship and of sacramental worship. There are differences again, on this, but I think in a lot of ways the evangelicals are learning and can learn about the value of the rich liturgical heritage which speaks very much to the whole person, to heart and head and imagination and aesthetics and beauty and embodiment – very critically embodiment – in the Catholic tradition. . . .
. . . Evangelicals are learning, and have a lot to learn from the Catholic moral tradition, the tradition of Catholic social teaching and the very bold stance that the Catholic church has taken on life issues. And right now, in your fantastic pope, writing about climate change and the ability that there is to articulate the principles of Catholic social teaching. More and more evangelicals as they engage the wider society are using the language, for instance, of ‘the common good,’ and evangelicals are learning that language of the common good largely from the Catholic tradition. I just think that is a wonderful resource, and we as evangelicals have a ton to learn, just beginning really in that direction. . . . The way that theologians, both Catholics and Protestant are working nowadays, is they’re reading one another, they’re in discussion all the time. The way that theological education works nowadays – I can speak for Regent College, where I serve as president – our students are reading Catholic authors all the time. 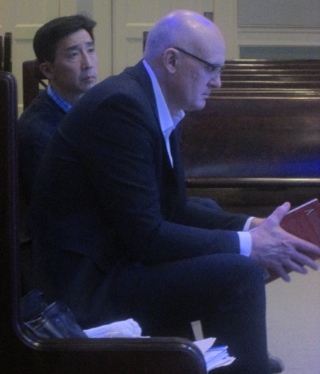 They love Catholic authors, they love Jean Vanier, they love Henri Nouwen, they love Tolkien, of course, we’re huge Tolkien fans, they love Graham Greene. . . .
Ken Shigematsu, pastor of Tenth Church, and Dave Koop, pastor of Coastal Church, were part of the appreciative audience. These excerpts give a sense of the rich conversation between Brett Salkeld and Jeff Greenman, but they also discussed signs of hope for closer cooperation, the main challenges still remaining – and much more. As well, urban missiological statesman Ray Bakke put the whole event into perspective with his perceptive closing comments. As Jeff Greenman said, such gatherings are essential. The conversation was a treat, and so were some of the personal interactions afterwards. An old friend – suspicious of the Catholic church – had clearly enjoyed the event. And I ended the evening at the Tim Horton’s across the street from Coastal Church chatting with a couple of Vancouver’s senior Catholic priests, along with Brett Salkeld and an enthusiastic young evangelist who attends both Catholic and Pentecostal churches.